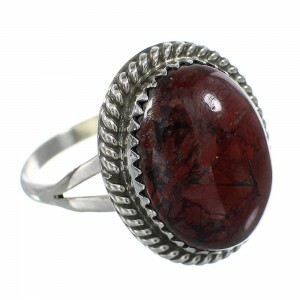 Sterling silver and real Jasper. 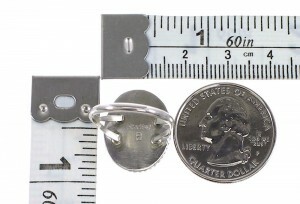 Ring is size 6-3/4, it measures approximately 3/4" long and 5/8" wide. This is a very exquisite ring that must not be overlooked! 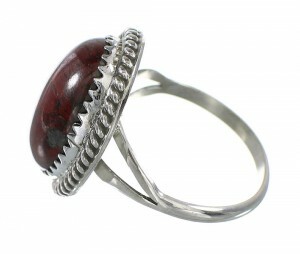 This piece of Native American jewelry is Navajo hand crafted by artist B. Benally, out of genuine sterling silver and a real Jasper stone. The stone is delicately placed in a hand cut bezel setting, while twisted silver can be seen highlighting the stone for a gorgeous look. The ring is stamped sterling and hallmarked. 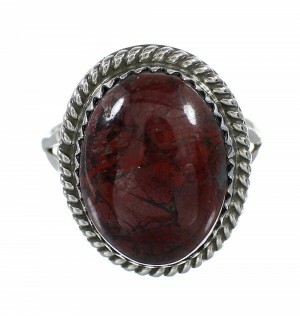 Jasper is the birthstone of July. It is a powerful healer. It strengthens, grounds, and protects you from negative energy.